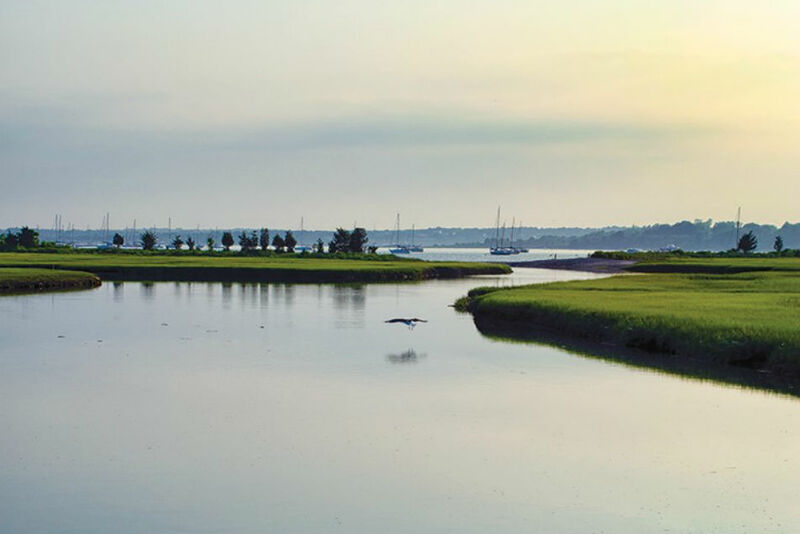 Did you know that an estuary is where fresh water from rivers mixes with salt water from the sea? On average, seawater in the world's oceans has a salinity of approximately 3.5%, or 35 parts per thousand. This means that for every 1 liter of seawater there are 35 grams of salts are dissolved in it. This blog will cover the basics of marine science and take a look at a special Rhode Island organization, Save The Bay. The earth is approximately 70% water and only 3% of this is fresh water. This leaves approximately 97% of the Earth’s water to the oceans. Marine science is the study of the physical, chemical, geological, and biological aspects of the oceans. As you can imagine, the study of marine science is extremely important and plays a vital role in maintaining the health of our oceans. Marine scientists closely examine each of these categories and how one can impact the other. This helps to determine key data and statistics about the ocean. One can also study the ecology while looking at the life cycles and how they are affected by the physical, chemical, and geological characteristics. Our oceans are home to approximately 27,000 species of fish alongside many marine mammals, other animals, alga and plants. Still even today, there is much that we can learn about the oceans. By testing water sources in the same area on a regular basis, scientists can determine if the water quality is normal or if something troublesome may be occurring in the ecosystem. 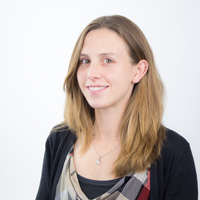 If one or more of the chemical properties is out of normal range then scientists can determine what the problem might be, where it is coming from, and hopefully how to fix it. By collecting and testing water samples frequently, scientists can quickly act and respond to changes that may be occurring in a body of water. Pollution plays an enormous role in maintaining ocean water quality. Some of the main pollution problems are oil spills and fertilizers. Eutrophication is another problem scientists see affecting large and small bodies of water, both fresh and salt. Some unseen pollution that impacts life is the overabundance of trace and heavy metals that years ago were not found in the oceans. Examples include mercury or polychlorinated biphenyls (PCBs). These are harmful because they bio-accumulate and increase in quantity as one moves up the food chain. These foreign bodies can harm the water quality as well, making marine life sick, affecting their reproductive system or even causing death. These then can make their way through the food chain, eventually reaching humans who eat the fish that contain the harmful chemicals. The ocean is a heat generator that supplies the atmosphere with the majority of its water vapor. The ocean feeds weather catastrophes such as monsoons, hurricanes, droughts, and El Niño. There are a tremendous amount of air-sea interactions that occur daily and impact the climate. Evaporation and precipitation are important aspects of chemical oceanography. The more it rains, the lower the salinity levels will be. However, during a drought, one will find higher salinity levels. The smaller the body of water, the greater the change. If there is a large change in salinity, many fish may not be able to adapt and will have a difficult time surviving these conditions as a result. On the other hand, there are a few fish, such as tilapia, that are quite adaptable to both an increase and decrease in salinity levels. How do we Determine Ocean Water Quality? Temperature is one of the most common physical quantities in our everyday life. In the ocean, temperature can provide an indication of living conditions for marine plants and animals. Warm temperatures are generally considered beneficial for growth of marine populations. However, after a certain point, temperature can have the opposite effect, contributing to a decline in the biological diversity in an ocean body of water. On the other hand, in extremely cold environments, plants and animals are forced to adapt to temperature changes or populations will decrease. Ocean temperature affects all aspects of marine science – biological, chemical, physical, and geological. It impacts the atmosphere and influences the climate. Even the slightest change in temperature can have a drastic effect on the weather, the physical properties of the ocean, and marine life. With the increase of carbon dioxide, as discussed earlier, scientists are slowly starting to see an increase in temperature globally, which could have major impacts worldwide. When the sea surface temperature is cooled, the water on top becomes dense and sinks forcing the warm water below to rise to the top. This process helps to create currents. Eventually, a thermocline is formed where there is warm water on top and cold water underneath. The oceans around the equator are warmed during summer months; this causes large quantities of ocean water to be evaporated, which can then feed hurricanes. Hurricanes thrive on warm water and do not survive in cooler waters. El Niño is a climate event where the water in the eastern Pacific tends to stay warm for a long period of time. This warming of the ocean can cause heavy rains in parts of the country and cause extreme droughts in other areas. It also has a devastating effect on marine life that depend on the cooler waters in the winter. Marine life that would normally migrate south during the winter do not need to do so because the water remains warm. This forces them to eat any fish and plants around the area that normally would not be touched until the following year. As a result, this creates an imbalance in the ecosystem both locally and where the fish would migrate to normally. La Niña is when the waters in the Eastern Pacific stay cooler than usual. Marine organisms such as most fish and plankton are cold-blooded, so the temperature of the water has a direct impact on their body temperature. These organisms only can survive within specific temperature ranges. As the temperature reaches closer to the high temperature range for an organism, biological activity will be at a peak. Conversely, this activity will decrease at the bottom of the range. 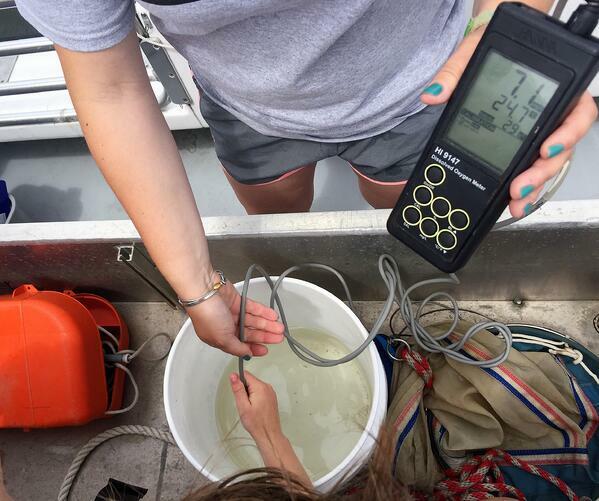 If the temperature exceeds the acceptable range for an organism, the available supply of dissolved oxygen may be too low to sustain marine life. Warm water has an oxygen saturation point much lower than cold water, as mentioned in the DO and CO2 sections. If the water temperature is too cold, not enough biological activity can take place to grow the organism. On the other hand, high temperatures can contribute to the growth of algal blooms. Oxygen is used by bacteria to decompose the dead organic material. In this case, little to no oxygen is left for the fish to breathe. The temperature of the ocean can also be influenced by rivers or streams flowing into it. This is especially the case for an estuary environment. If the flow of water is increased, perhaps through rainfall, the temperature can be expected to decrease. The increased current has a cooling effect on the temperature of the water. Sea surface temperature (SST) is constantly being monitored by marine scientists and meteorologists for any long term changes in temperature. If there are changes or any anomalies, they pay close attention to what may be the cause. 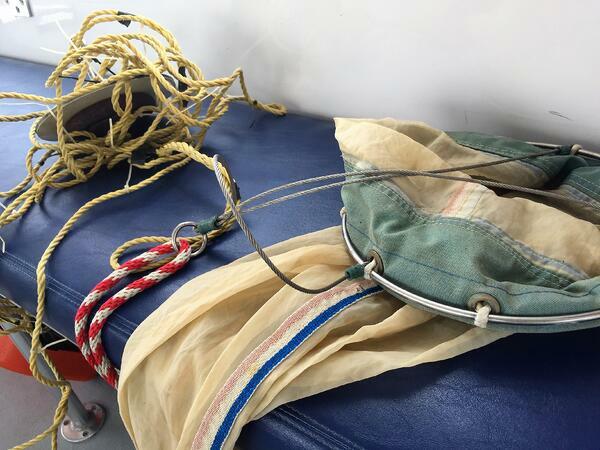 When sampling for fish, chemicals, geological aspects, and biological organisms in an area, temperature is always taken. This allows scientists to know what is able to grow and thrive in certain areas. By following SST trends, scientists can determine migrant trends in fish and marine mammals. They can also determine the probabilities of storms, including hurricanes. Satellite imagery is typically used on a daily basis to determine the SST. By comparing various years, climate events such as El Niño or La Niña can be hypothesized. Hurricanes can also be predicted and the potential for large algal growth can be anticipated. By using satellite imagery, scientists can also predict where strong currents may arise or if the mixing of various water temperatures is occurring. The thermometer uses thermistor technology. The thermistor is a semiconductor device whose resistance varies as a function of temperature. As the temperature rises, the resistance decreases. This resistance measured by the thermistor is then converted to a value displayed on the Celsius or Fahrenheit scale. Thermistor sensors are suitable for a temperature range of -50° to 150° C (-58° to 302° F). Accurate temperature measurements are possible to the tenths of a degree due to the high sensitivity of the sensor. Salinity is the total amount of dissolved salts within any given body of water and is expressed in parts per thousand (ppt). Typically, in fresh water, salinity levels are very low with less than 1 ppt. In an ocean, the range of salinity is typically 30-40 ppt with an average of 35 ppt. The dissolved salts in the water come from a variety of places. One source is from water that travels from rivers; as the water flows, rocks erode and salt is dissolved into the freshwater. As the water travels toward the oceans, the amount of dissolved salts increases by the time it reaches the river mouths. A major source of salinity levels is the erosion of coastal rocks and shorelines which contain high levels of salt. When the sea water erodes the minerals from these coastal rocks, high quantities of salt are dissolved into the ocean. Salinity levels affect the type of wildlife one would find in a specific local marine environment. Certain animals such as tarpon, clams, sand dollars, and sharks have adapted to surviving in salt water. They are considered either osmoconformers or osmoregulators. Salt water fish will tend to drink more water and urinate infrequently due to high salinity levels. Similarly, certain plants have adapted to survive in high salinity levels. Plants include mangroves or turtle sea grass. Again, they must live in salt water in order to survive. These plants and animals will rarely survive in fresh water. However, freshwater plants and animals will typically not survive in saltwater. Occasionally, certain species of fish, such as tilapia, can survive in both fresh and salt water. The complete balance of salinity levels within any marine or freshwater ecosystem is pertinent to the survival of the ecosystem itself. Too much salt in water can cause the pH to rise. However, since the oceans typically have a balanced cycle of salinity levels, the pH will remain the same. All organisms are susceptible to slight changes in pH, which can be lethal if the change is too great. In an aquarium the salinity levels must be checked and regulated frequently so the pH is maintained. The pH needs to be monitored regularly to protect against the effects of a drastic change in salinity. the water, and this can possibly cause an increase in pH. How do we measure salinity? Salinity can be measured in several ways. One method is to use a conductivity/TDS meter. Another method is to use a chemical test kit. Measuring specific gravity is another way to assess the salt content of a water sample. The concentration of dissolved oxygen (DO) in water is extremely important in nature as well as in man’s environment. In the oceans, dissolved oxygen is essential to the growth and development of marine life. Without oxygen, the water can become toxic due to the anaerobic decaying of organic matter. The dissolved oxygen level within the oceans can range from 0-20 ppm, where greater amounts typically reflect a healthy, thriving environment. However, DO ranges generally fall around 5 ppm in tropical waters since warmer water cannot hold as much dissolved gases. Alternatively, in colder waters, one would expect to find a higher concentration of DO. In the ocean, DO levels can help indicate the relative health of the sea itself. If DO levels are normal or high, the water is a good environment for a variety of marine life to flourish. If DO levels are low, it may indicate the presence of either pollutants in the water source or an algal bloom. Some marine life can exist in water with a wide range of DO, but others cannot survive in a low DO environment. DO measurements are expected to have large fluctuations if the water has significant plant life. This is due to photosynthetic activity. Since there is less photosynthetic activity at night, when light is not present, the plants do not produce oxygen. In fact, both plants and animals in the water consume oxygen through respiration. So, DO levels in early morning are lower when compared with DO levels throughout the rest of the day. Once the portion of photosynthesis that uses light begins, DO levels will rise. This is a good example of the benefits of measuring parameters at various times during the day. If only a predawn DO measurement is taken, an inaccurate conclusion may be drawn regarding the healthiness of the water. While DO levels are partially influenced by photosynthetic activity, a large source of DO is from atmospheric-ocean interactions where oxygen in the air mixes with the ocean water. This is especially true in a turbulent or windy region of the ocean. As the wind blows over the ocean water, it generates waves. An increase in waves and turbulence creates more surface area which in turn allows for more oxygen to be dissolved within the water column. Other factors that influence DO levels are temperature and runoff water from freshwater rivers into the oceans. Oxygen dissolves more easily in cold water, while warm water cannot hold as much oxygen or any other dissolved gas. Runoff can include natural organic wastes or man-made pollutants such as spills, chemicals in boat paint, heavy metals from industries, and any other intentional dumping of waste. This can happen both on and off shore. Organic wastes can lead to the growth of aquatic vegetation. These create massive blooms, and when they die at the end of their reproductive cycle heavy oxygen consumption by bacteria takes place during the decomposition of the algae. Not only are toxins released, but the decrease in oxygen can cause the death of fish in the surrounding areas. Regardless of the influences of DO, animals in the ocean must use oxygen for cellular processes. Without oxygen, animal life would not be possible. Scientists constantly measure the DO levels of many water sources. A large fluctuation in DO levels may mean that an algal bloom is taking place or, if close to the shoreline, pollution may have contaminated the water. Also, scientists monitor the changes in dissolved oxygen over long, extended periods of time. Any changes may be an indicator of climate change, which could lead to major environmental and habitat changes as well. A great way to measure dissolved oxygen is with the use of a dissolved oxygen meter. These meters use probes with a membrane covering the sensors. The thin permeable membrane isolates the sensor elements from the water sample, but allows oxygen to enter. When a voltage is applied across the sensor from the meter, oxygen that has passed through the membrane reacts causing current to flow, allowing the determination of oxygen. All marine life depend on seawater for survival. Researchers are frequently testing water quality to monitor ecological or geological changes that may be happening within an ecosystem. By understanding the world around us, we can gain valuable insight into how humans impact the natural world. Marine science plays a pivitol role in understanding the influence of human activity on the earth. 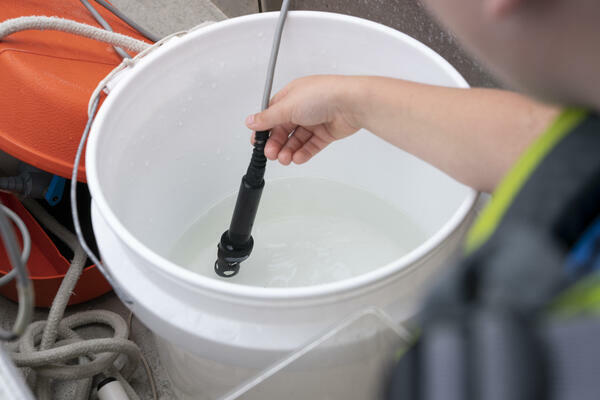 This blog features our friends at Save the Bay, who can be seen collecting and testing water samples from Narragansett Bay in Rhode Island using Hanna's field testing equipment. 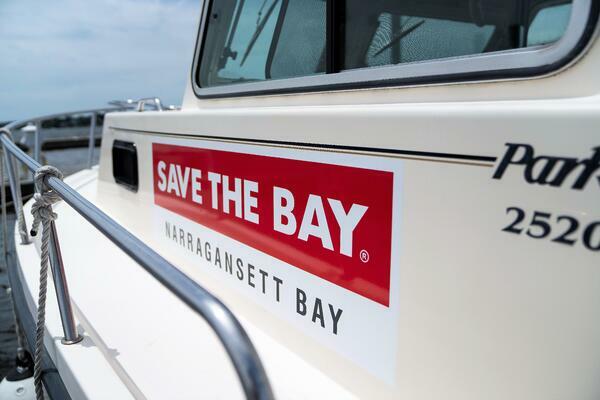 Founded in 1970, Save the Bay is a local organization whose mission is to protect and improve Narragansett Bay and its watershed. Save the Bay provides educational opportunities for children and adults to explore the Bay, fostering an understanding and a sense of personal responsibility for this precious resource. 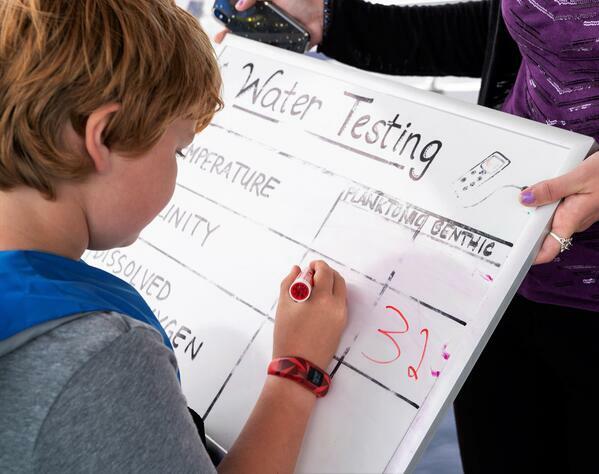 For years, Save the Bay has provided public education through experiential learning with Narragansett Bay as the classroom. This hands on approach helps to educate the public on the importance of keeping our oceans ecosystems healthy and thriving.